Clear stadium tote bag with Blanket. Select from a variety of blank options. 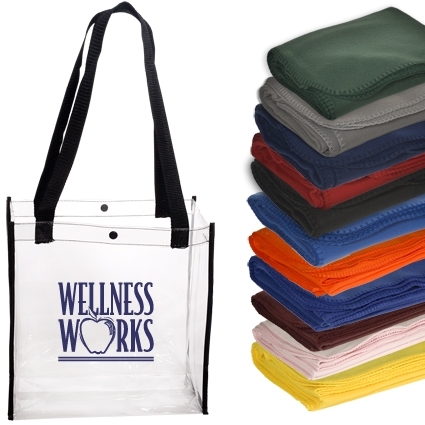 $80 set up fee includes up to 3 -color/1 position logo on the blanket and imprit on tote. More than 3 colors.... add .75 per bag and per tote. Clear Stadium Tote bag with blanket. Snap button closure. Complies with NFL stadium security requirements. Blanket Size: 50"w x 60"h 100% polyester fleece with whipstitch trim. 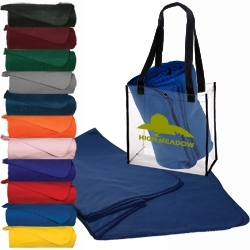 Tote is made from clear PVC with terylene handles and non-woven trim.